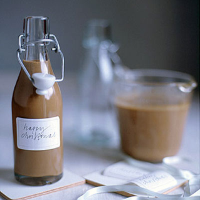 This makes a great gift for those who love creamy coffee liqueurs, and this version is not as cloyingly sweet as some bought brands. Use small bottles that come with corks or spring clips with rubber stoppers. Alternatively, fill small, empty spirit bottles. Store the liqueur in the fridge and use within two weeks, ideally poured over plenty of crushed ice. Make a small, strong pot of espresso coffee and pour 175ml into a measuring jug. Add the finely chopped chocolate and stir until it is completely melted. Leave to cool. Pour into a blender and add the condensed milk, vanilla and whiskey. Blend for a couple of minutes until smooth. Pour into a jug and chill for several hours. Remove any skin that forms on the surface, pour into small, thoroughly cleaned bottles and label. Keep refrigerated.